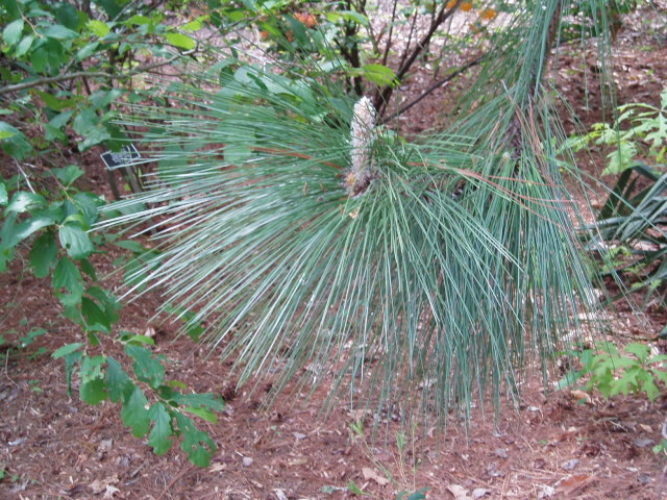 Pinus palustris, as described in 1768 by Philip Miller (1691–1771), is commonly known as longleaf pine, longleaf yellow pine, or southern yellow pine. The species name translates into "of marshes" in the Latin language referring to this pines adaptability to thriving in dry or wet sites. Ethnobotany. This species is valued for lumber and pulpwood and was once important for naval stores (e.g., turpentine, pine oil, tar, pitch). Description. 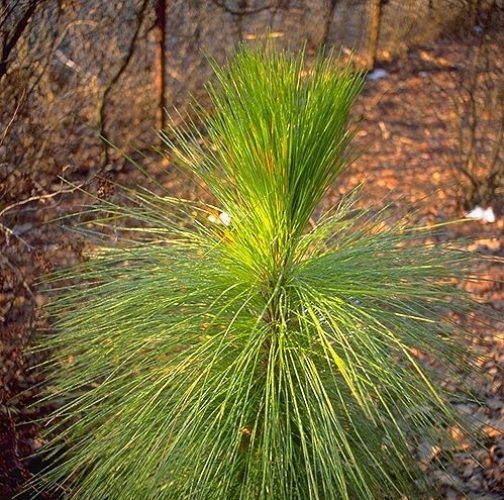 Longleaf pine is an evergreen coniferous species of tree that grows to mature heights of 150 feet (47 m) with a straight trunk to 48 inches (1.2 m) in diameter, measured at breast height; and a rounded crown. Bark orange-brown in color, with age breaking into coarse, scaly, rectangular, plates. Branches grow spreading-descending, upcurved at tips. Twigs are stout and rough, up to 0.8 inch (2 cm) thick, colored orange-brown, aging darker brown. Foliar buds are ovoid shaped, colored silvery white, measuring 1.2 to 1.6 inches (3 - 4 cm) long; with narrow scales and fringed margins. Leaves (needles) are borne in fascicles of 3 (sometimes 2), growing spreading-recurved, persisting 2 years on the tree, Each measures 8 to 18 inches (20 - 45 cm) long by circa 0.06 inch (1.5 mm), growing slightly twisted, colored lustrous yellow-green, with all surfaces bearing fine lines of stomata. Needles margins are finely serrulate, with abruptly acute to acuminate apices. Foliar sheaths measure 0.8 to 1 inch (2 - 2.5 cm) with a persistent base. 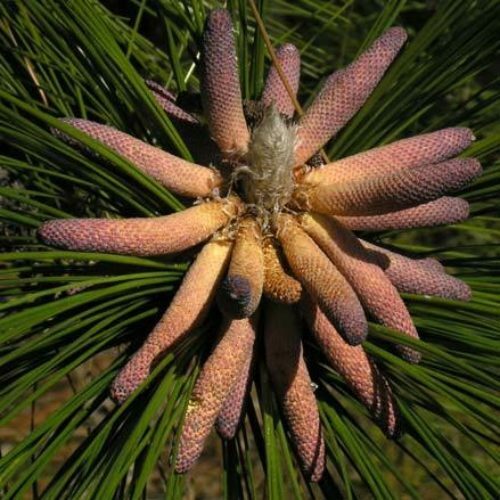 Pollen cones are cylindrical shaped, measuring 1.2 to 3.2 inches (30 - 80 mm), and purplish in color. Seed cones mature 2 years after pollination, quickly shedding seeds and falling. 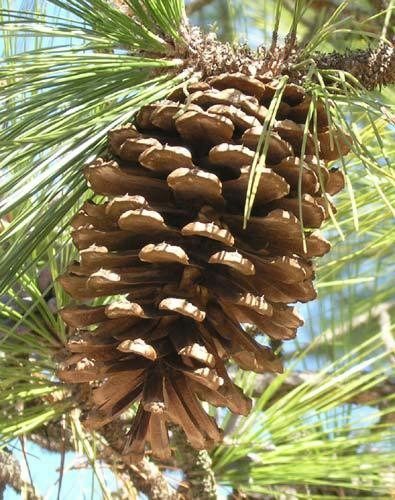 Cones are borne solitary or paired toward branchlet tips, shaped symmetrically lanceoloid before opening, ovoid-cylindric when open, measuring 6 to 10 inches (15 -25 cm), colored dull brown and sessile (rarely short-stalked). Cone scales number 75 to 150 per cone. Apophyses are dull, slightly thickened, slightly raised, nearly rhombic in outline, and strongly cross-keeled. Umbo is centrally positioned, broadly triangular, with a short, stiff, reflexed prickle. Seeds are truncate-obovoid; body measures circa 0.4 inch (10 mm) long, colored pale brown, mottled darker, with an attached wing mesuring 1.2 to 1.6 inches (30 - 40 mm) long. Distribution. This species is native to USA — Virginia, North Carolina, South Carolina, Georgia, Florida, Alabama, Mississippi, Louisiana and eastern Texas growing at elevations from sea level to 2,250 feet (0 - 700 m) on the Atlantic and Gulf coastal plains. Typical habitat dry sandy uplands, sandhills, and flatwoods. Hardy to USDA Zone 8 — cold hardiness limit between 10 to 20ºF (-12.1°C to -6.7°C). Attribution from: R. Kral, 1993. Pinus-Flora of North America Editorial Committee (editors); Flora of North America North of Mexico, Vol. 2; ©1993, Oxford University Press. 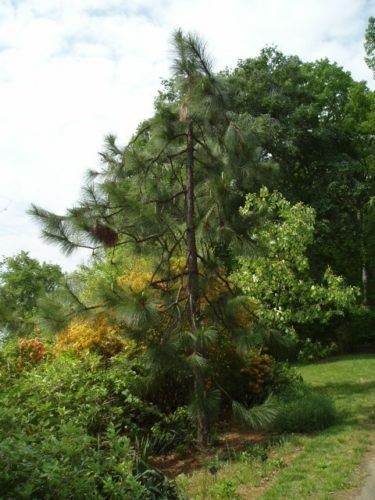 Pinus palustris at the Gotelli Collection of The U.S. National Arboretum, Washington, D.C., May 2006. Pinus palustris Pinus palustris at the Gotelli Collection of The U.S. National Arboretum, Washington, D.C., May 2006. 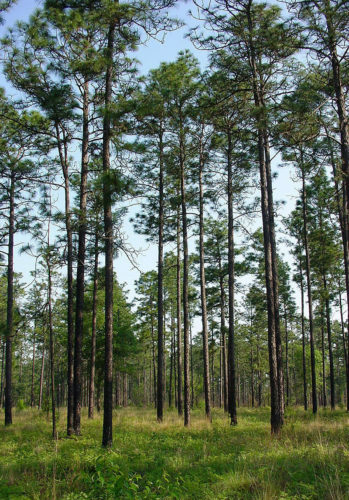 Pinus palustris forest in habitat. Pinus palustris — a mature seed cone in situ. Pinus palustris — pollen cone detail.